Thanksgiving Is Sort Of Here! – Beware the Comfort Zone! We all know the classic First Thanksgiving story. In a nutshell, the pilgrims showed up to an unknown, undeveloped land, only inhabited by “savages” and a scattered handful of Spanish settlers and explorers. They gathered, had a feast, and then went about conquering their new land. And the rest, they say, is history. So what if the pilgrims had taken a wrong turn, and landed in the Philipines? Somehow I envision a similar scenario. Restless head hunting natives, harsh, unforgiving environment, and a long road ahead to civility. But, in 1620, the Philippines was well on its way to becoming a major world leader. Magellan landed 100 years earlier, and was followed by a steady stream of settlers and explorers from Spain, Portugal, The Netherlands, China and Japan. Colleges were founded, trade routes to Mexico established, Christianity and Islam introduced, and governments instituted. But, despite the jumpstart the Philippines had in terms of development, the histories are very much the same. Both places have a “melting pot” history, just on different timelines. Both countries have been desired by groups seeking a better life. The native tribes weren’t all too excited about their conquerors, leading to dozens of revolts and battles over the next several decades (sound familiar?). If the pilgrims had landed in the Philippines, would they have been lured by the warm weather, ideal growing conditions, and already developed infrastructure? Would they have settled down, had a meal of lumpia and pancit with the natives, then began taking island after island, taking on other settlers along the way? Or would their pioneering spirits have led them to their original destination, away from the crowd? Obviously we’ll never know, but it’s interesting to wonder. We don’t wake up at the crack of dawn to begin cooking turkey and preparing stuffing. We don’t watch the Macy’s Thanksgiving Day Parade in the morning, and football in the afternoon. We don’t wake up at the crack of the following dawn to mob the big box stores (and even if the stores are open on Thanksgiving, for crying out loud, don’t support it! Let the workers enjoy Turkey Day too!). We don’t put up Christmas decorations the day after, since they’ve been up for months. But, we do have so much to be thankful for here in “our new land”. 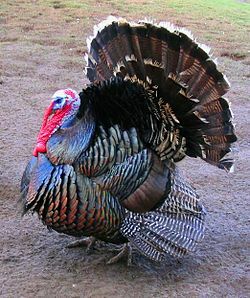 Even if we’re only eating pygmy turkeys. Happy Thanksgiving all, be blessed!